Why The Sudden Surge Of Retractions At Nature Magazine? In past years, the peer-reviewed journal Nature has had to retract scientific papers at a rate of about one or two each year. But in the past two years it's had to retract over a dozen. So what's going on, science? Academic papers tend to be retracted after publication for one of two reasons, either because of an honest error or on account of misconduct — a deliberate attempt to deceive. Clearly, the latter is far worse than the former. And in fact, the admittance of an honest error can sometimes bring credit. 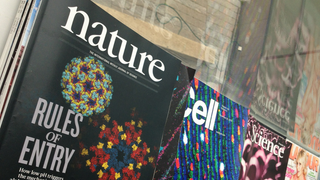 In 2013, Nature retracted six papers. This year, they've already had to retract seven (and the year ain't over yet). It's a trend that's not exclusive to this particular journal. Given this frustrating trend, Nature's editors have reviewed these and previous retractions to figure what's going on. If science is broken, how do we fix it? They found that most of Nature's retractions came about through honest error, "where authors have either discovered mistakes themselves after publication, or have had the errors brought to their attention and taken action." Also, the process of having a paper retracted can take years. And sometimes, when an institution and a journal both want a paper retracted, their interests in doing so sometimes collide. It's often a long, arduous, and emotionally-charged process. We can only speculate. The publication dates of the papers retracted in the past two years range from 1994 to 2014. Data are nowadays more openly available and online scrutiny is increasingly vigorous. Some of the rise may parallel the growth in formal corrections associated with increased problems of irreproducibility, which in turn can arise from sloppiness in some overly pressurized laboratories. That should add to the concern of those worried about wasted funds for research. But the concerned should also pay attention to what must be increasing costs in legal fees, because those under investigation increasingly turn to lawyers to defend themselves and their reputations, and their employers and journals are more frequently having to respond accordingly. Personally, I think it's fair to say that scientists have never been under more scrutiny than they are today. Moreover, given that science is getting increasingly complex and data-ridden with each passing year, there's a heightened chance for error. Regardless of the reasons, and in the words of the editors, "the duty to retract a demonstrably false paper remains paramount."